Tracey Schofield, commercial property partner at our Belfast office, was named 'Best in Professional Services' at the recent Women In Business Awards 2018 at the Crowne Plaza Hotel, Belfast. The Awards celebrate the dedication, achievements and talent of females in business in Northern Ireland. 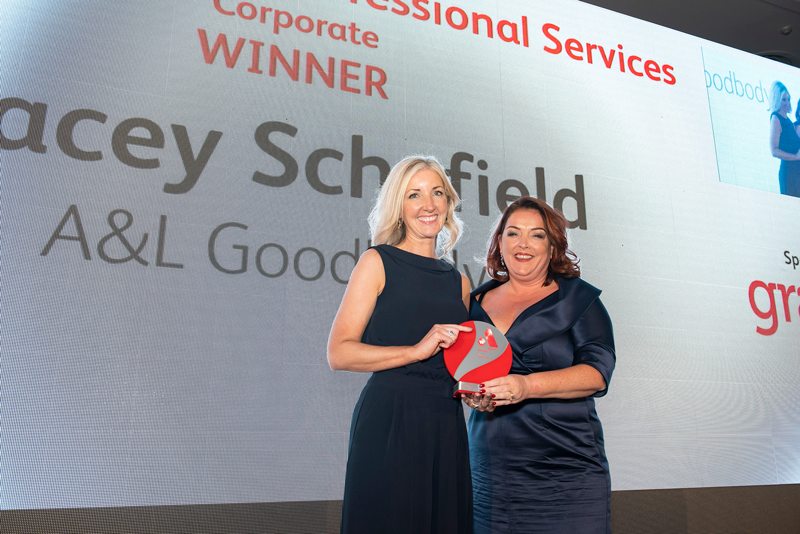 Tracey was awarded the accolade in recognition of her outstanding contribution to the commercial property sector in Northern Ireland, and her leadership within A&L Goodbody – both as commercial property partner in the firm and as the dedicated diversity and inclusion partner in Belfast. “From the very outset of her career, Tracey has consistently demonstrated that she is a true leader in her field. “As a partner at A&L Goodbody, she has not only contributed significantly to the success of the firm but has made a hugely positive impact across wider firm life through her leadership in CSR and diversity and inclusion.